Q. is this product a back to the wall WC? Hi, unfortunately the free delivery is only for the mainland UK, The delivery charge to the isle is dependent on the goods ordered and the size of the package. As an example if it was just for the RAK toilet it is £17.95. Simply add items to basket and put in postcode to check shipping rates. I hope this helps, thanks! Q. What is the height from the pan to the floor? Hi Carol, the height is 455mm. All dimensions can be found on each product page under the 'product dimensions' tab. I hope this helps, please let me know if you have any further questions. Hi, the prices on our site are all inclusive of VAT. Thanks. Q. When stood facing toilet whci side is the water feed inlet? 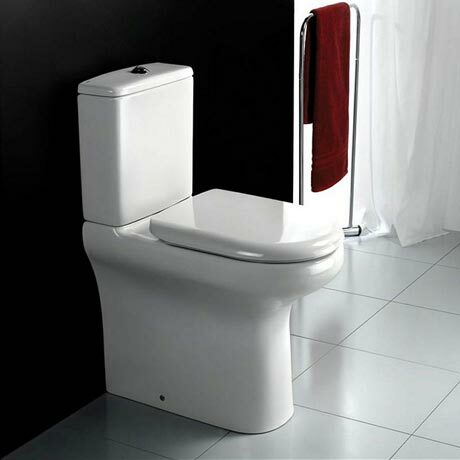 Hi, the RAK Compact Deluxe Extended Height Close Coupled Toilet comes with the cold water feed on the left hand side but there is a blanking plug on the other side so it can easily be swapped over. Hope this helps. Delighted with the product which is slightly higher than normal.